It was learnt that the 30-year-old was with his friends in a Toyota Sienna when the incident happened. A family member of the father of four, who spoke to The Punch on the phone, said Onyeme gave up the ghost at the Odumegwu Ojukwu University Teaching Hospital, Amaku, where he was rushed to for treatment. He said it was during the time that Onyeme was shot dead by one of the cops. He said, “I am a sales rep for a table water company. My driver and I were travelling from Awka to Okwo to deliver cartons of table water to a customer when the policemen stopped our Ford bus. “His colleagues shouted that there was a policeman in the car and he stopped. The same policeman that cocked his gun heard my altercation with his colleagues. He said I was talking as if I wanted to slap their oga(boss) and that if I did not slap their oga, he would slap me. I told him that it was not true and if he wanted to slap me, he should go ahead. “You need to see the way they were harrasing motorists. They were rudely demanding bribes from people and had confrontation with more than six motorists. It was learnt that the incident was reported at the Central Police Station. 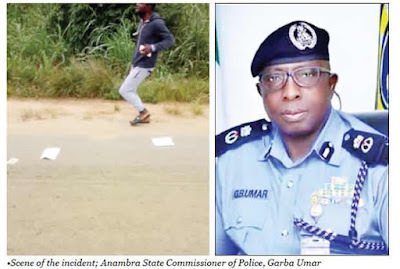 As of press time, The Punch learnt that the atmosphere of Agulu, where the victim hailed from, was charged, as Onyeme’s family members took his remains to the Central Police Station.